Smiths Interconnect's MIL-DTL-38999 connectors offer data rates exceeding 2 Gbps and bandwidth up to 3 Ghz. 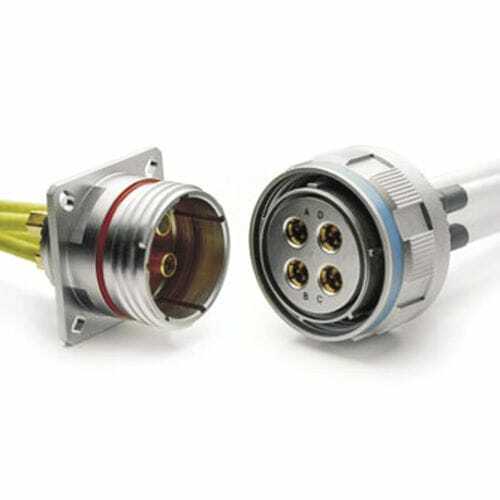 The connectors can be driven via matched impedance differential pair interconnections for board to board high speed data transfer and are ideal for reliable, high-speed transfer of digital audio / video signals. Smiths Interconnect offers a complete line of differential Quadrax connectors, contacts, and cable assemblies for high speed Ethernet, Firewire, and Fibre Channel applications. Differential pair quadrax connectors offer superior performance in high speed matched impedance data-on-demand applications. The signal to signal and signal to shield characteristic impedance is maintained throughout the connector pair. Smiths Interconnect offer reverse gender Quadrax contacts to provide a more robust assembly for harsh environment applications. This alternative configuration places the stronger and larger diameter inner socket contacts within the more exposed Quadrax pin contact insulator. The more fragile inner pin contacts are then placed within the Quadrax socket contact insulator minimizing the potential of alignment damage due to mishandling on both sides. With this arrangement, Smiths Interconnect offer the most robust high speed Quadrax contacts available today. Designed for ease of assembly quadrax construction.